The Panasonic ES3833S Pro-Curve travel shaver provides a number of benefits for the busy man on the go. The shaver allows for wet or dry shaving and is battery operated. Let’s take a look at the details of this product before we look at how effective it is. Allows for wet or dry shaving. Easily washable, cleans by simply rinsing with water. Provides a comfortable shave with its floating head allowing it to fit facial contours. Provides up to 90 minutes of shaving with 2AA batteries. Includes slide-up wide trimmer for precision trimming of mustache and sideburns. The Panasonic ES3833S Pro-Curve travel shaver works as a primary shaver, yet is portable enough to be carried for a touch up shave during other times of the day. The shaver has a floating head which has been specifically designed to fit the contours of the face comfortably. The nickel free material is also hypo allergenic for people with sensitive skin. This travel shaver has been designed with a single blade with precisely angled inner blade for shaving off a beard closely and comfortably. The design also allows for easy cleaning by simply rinsing under running water, and has been built to be extremely durable for a longer lasting shaver. Shaving can be done with a lather, or just turn it on and shave dry providing the greatest convenience possible. This travel shaver comes with a molded travel case and brush. This makes the shaver able to fit easily in a brief case, vehicle, or travel bag. 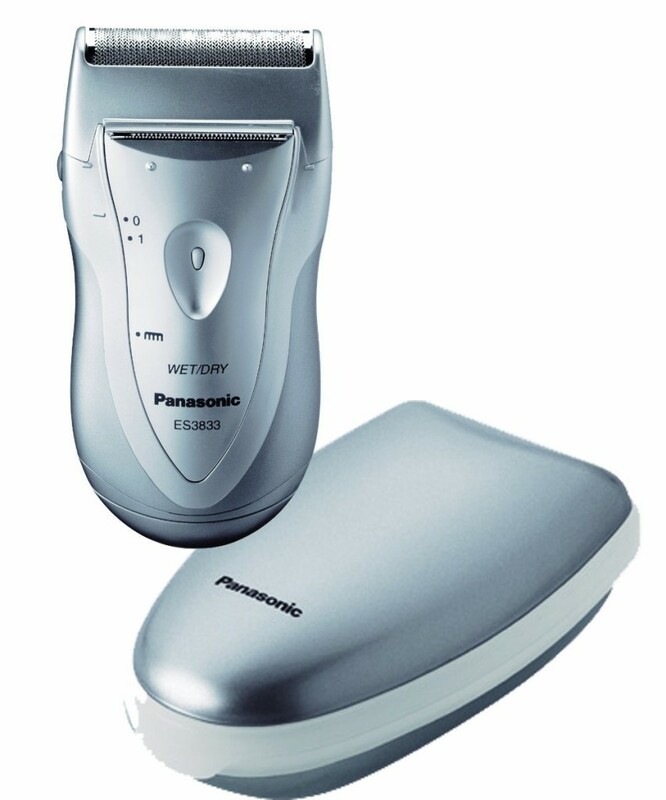 The Panasonic ES3833S Pro-Curve requires 2AA batteries which are not included and must be purchased separately providing the ability to shave virtually anywhere. The overall size and dimensions are 4.46 inches high, 2.36 inches wide, and 1.4 inches deep. With the changes in what people are permitted to carry on planes over the past decade or so, many people who prefer to carry a razor blade have found it challenging to keep a close shave while on the go. This has left many people searching for a suitable alternative to the typical straight razor. The Panasonic ES3833S Pro-Curve is a great alternative for those who still need to shave, but don’t have the ability to use a regular shaving blade. Battery powered devices are typically not powerful enough to do more than hack at hair on the face, but this device gets up close and personal. A plug in device isn’t practical on the go at times since they require the ability to have access to a plug. Many devices are big and bulky and cannot be carried easily. Most devices aren’t durable and easily break from being banged around in a suitcase or a briefcase. Are there any downsides to this device? Although the common opinion of the ES3833S is all positive, the common belief is that it isn’t as good as the Panasonic ES4815S which has been discontinued. Previous post: Electric Shaver vs Razor – Which One Is The Best?